It was a good job we were sleeping off hangovers after a friend’s birthday. We would otherwise have been at work when the paperwork arrived at the house needing a signature! I think the reality of the state of the house has just hit Baz, as the French process of buying and selling a house includes notes on asbestos, lead content and plumbing, etc and even in French it’s obvious that there are some “issues”. Not that it’s a surprise though. I dated a magazine on the floor in one room to 1975 and that is the last time anyone used the house, as far as we know. We have asked if we can have the docs translated into English so that we fully understand. But I think everything is pretty much in order. There is no work done without permission and there is very little plumbing present (only one very basic bathroom) so we are kind of starting fresh. I have opened my arrivals from Ebay and had a look. I am so happy with all the lights I have bought. 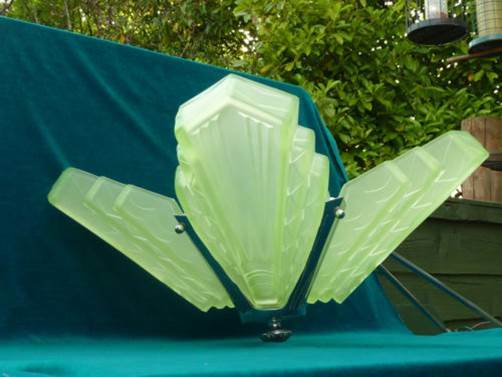 I have these fantastic green art deco wall lights and matching ceiling light which we picked up on Saturday and which are immaculate. I was gushing when we got to the guy’s house, telling the poor bloke how I have wanted to own something like these since I was a little girl. Honestly, there can’t be many people who would consider that normal and he must have thought I was certifiable, but it is actually true! 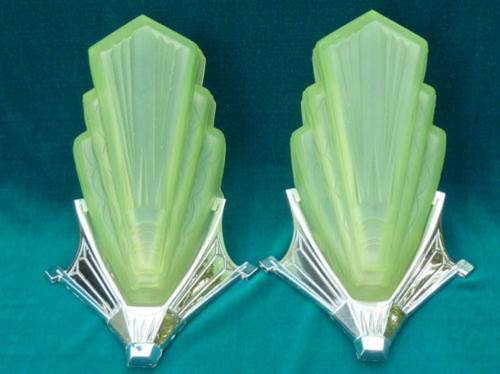 So we will have to dedicate at least one room in the house to my total art deco obsession. The rest of it may have to be more subtle, but it certainly won’t be bland. Next Next post: What can you get for a tenner?